Hey - what can we say... the doll has to have somewhere to sleep too! 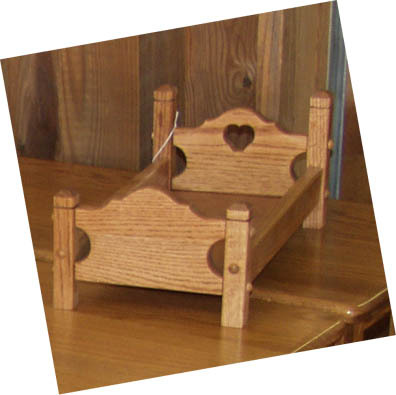 Your child will love our unique solid oak doll bed, made just for them by the finest Amish craftsmen. What a novel way to accent your Amish oak bedroom set, or your convertible children’s bedroom set, and adults can use it too! Those of you who collect dolls or teddy bears for your country home theme will find this bed is the perfect way to display your dolls or teddy bears. It comes just the way you see it - you will have to come up with a piece of quilt or something to use for bedding.